Kevin Trenberth once claimed that the hiatus in warming from 1998 to 2014 was simply due to ‘missing’ heat being sequestered in the oceans. 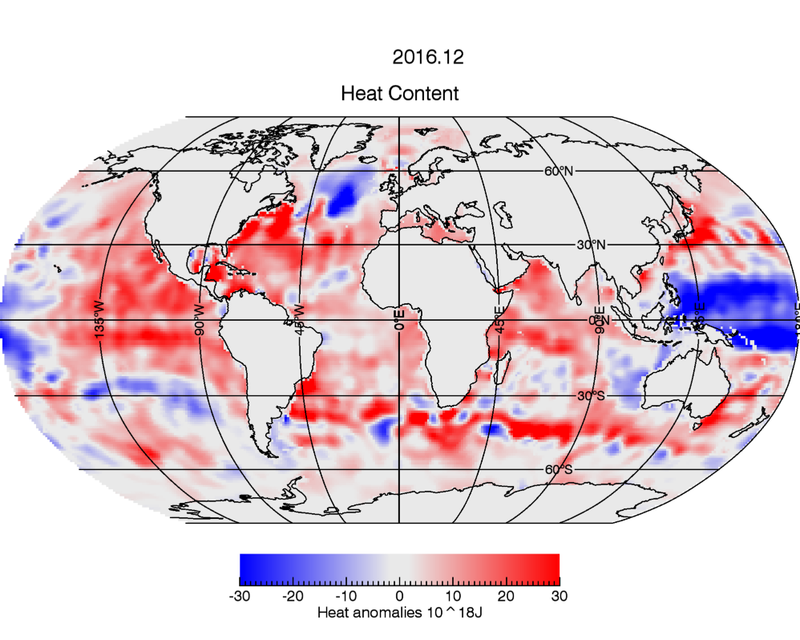 The annual global heat content to 700m indeed did show a rise, as estimated by measured temperature profile with depth. I have never looked at this NODC data until now. Here is a 3-monthly (JFM,AMJ,JJA,OND) animation of all the available data. Firstly it is obvious that seasonal changes far outweigh any long term change. There are large regional variations near the equator dominated by El Nino La Nina cycles, while the poles show little net change over time. If we look at the first 3 months of 2016 (below) we see the massive shift of heat by El Nino and that a large cold spot has appeared in the North Atlantic. This cold spot in the North Atlantic has been highlighted by Ole Humlum through his climate4you reports. Is this perhaps something to do with AMO, and if so what is driving it? Perhaps one answer lies with the precession cycle of the moon. Commenter ‘charplum’ (see The forgotten Milankovitz effect ) discovered an 18.6y signal in the Ocean Heat content data for the North Atlantic based on Humlum’s data. Tidal tractional drag is felt at all depths in the ocean and therefore can affect heat mixing. The position of maximum spring tides depends on the declination of the moon. The maximum tidal drag force is centered at around 45 degrees to the lunar declination angle. This varies with the 18.6y precession cycle. Maximum lunar standstill of 28.5 degrees last occurred in June 2006 while the minimum lunar standstill of 18.5 degrees occurred last October. The data suggests that in the North Atlantic enhanced tidal mixing increases the net heat content contained in the top 700m, while reduced mixing at minimum declination leads to central cooling. 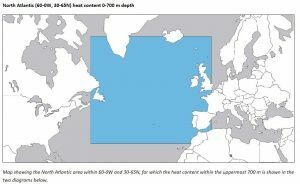 The UK sits right within the N. Atlantic study area used by Humlum, and its climate is dominated by westerly winds from the Atlantic. Could such tidal mixing be evident in the Central England temperature data? Again Charplum found evidence of a 18.6 year signal in the annual CET data. I plot below the data since 1750 with a superimposed precession signal. Central England annual temperature data from 1750 to present. The long term average is ~9.5C. Deviations are shaded blue and the 5 year Fourier average is shown in red. The sine curve represents the lunar precession cycle. It is always difficult to prove any effect when there are so many variables involved in a temperature series, including of course CO2. However it is tempting to associate just such a lunar signal in CET. This entry was posted in AGW, Climate Change and tagged CET, Oceans. Bookmark the permalink. 10 Responses to Ocean Heat Content variability. Since I could get the heat content for that specific ocean region I went back to the data to see if I could also get the temperature for that region. Other than the magnitudes being different, it looks very much like the heat content. There was an 18.6-year cycle there too. Its importance to the overall fit was far less than it was in the heat content. I determined that by sorting each frequency by its amplitude. It was much further down the list on temperature but it was there. a lot (with confidence) about OHC changes or trends anyway. I investigated two more regions for evidence of a lunar cycle of 18.6 years. I looked at both the RSS North Pole and the RSS South Pole. I did find it present. These two regions are interesting for several regions that I will get into. First, for the North Pole I found a modest cycle at 18.578 years. It is not prominent when compared to the other cycles but it is there. There is a long period cycle of over 2000 years too. For the South Pole there was also a modest cycle at 18.547 years. There was no long period cycle for the South Pole which is think is due to the flat linear trend in temperature. Note that on the figures I put the sum of the squares values and the correlation coefficients. I was surprised that although the South Pole had a smaller sum of the squares error its correlation coefficient was not as good. I don’t recall seeing that before. Putting on my Lt. Colombo trench coat other observations can be made. Note that for the North Pole that the most recent El Nino, seemingly, played a part. However, what happened to these same events in 97-98 or 82. Maybe, it can be argued that the 97-98 El Nino is there but it sure is not prominent like the most recent one. The North Pole has the highest linear temperature trend. The South Pole actually has a negative trend. Before getting directly involved in analysis work I have to give Joe Bastardi credit for getting me interested. He was the one that mentioned the 60-year cycle and got me interested in looking for it. Until just a few weeks ago Joe used to put forth his weekly forecasts and he also explained many climate issues. This is one that grabbed me not too long ago. The way Joe explained this is that he is not worried about loss of Arctic ice so long as summer temperatures stay about where they are. The warmer North Pole seems to come from warmer winter temperatures and not changes in the summer. It is still cold in the winter as he explained and ice will still be made. I miss joe’s forecasts and explanations. As a bonus today I offer additional analysis I have done on the sea level rise as measured by satellites. I found this on Climate4you. I had some fun with it and concluded that the Statue of Liberty won’t be getting its toes wet anytime soon. I think you expect a lunar cycle effect to be more apparent at the poles. This is because it is the ‘horizontal tidal force that drags the oceans (and atmosphere) into a tidal bulge. This is concentrated 45 degrees to the moon-earth axis. Every 18.6y the moon reaches its maximum declination of 28 degrees so that places the maximum drag force at 73 degrees – right in the arctic/antarctic region. In winter without sunshine the effects can become more important. Yes 40cm rise in sea levels by 2100 is not disastrous! Today new daily dat became available for the four Nino regions. The four figures are in the link. It looks like the pattern is holding. Looks like a La Nina for them. We shall see. Via email I sent the Nino region updates to Dr. Evans and Dr. Norman Page. They both replied but Dr. Page sent me this. Here is another link worth a look. It is from Australia too. Their outlook is different than NOAA’s. That SOI, however. We shall see. It has been a while but today I analyzed AMO temperature anomalies and found an 18.6-year cycle. Last week, just to see if there was a difference between oceans, I checked the same latitudes in the Pacific between 160 to 240 and found the cycle there too. Seems to be consistent. If you want the details in figures I would be glad to furnish them. I think there would have to be one in the AMO temperatures for both the UK and Ocean heat data to be consistent. The question is how statistically significant is the 18.6y cycle? Perhaps you could try fiting it without it and see how much worse is the fit. There are a number of longer period cycles in this analysis so it does not necessarily stand out. I tried your suggested experiment and I am not surprised the way it turned out knowing the way the program works. The program can adjust amplitude, frequency and phase in its attempt to minimize the error. I deleted the 18.6-year cycle to see what would happen and one of the other frequencies changed to a period of slightly over 19 years. It tried to replace it. On the AMO you are going to have to wait a bit longer. Blame it on my bad eyes. What I though was 18 some years was actually 16. What I have done is to change that 16 year cycle as an input of 18.6 and see how it adjusts. The 18.6 year cycle in the AMO is currently in question. I will report later. The answer came in quicker than I thought it would on the AMO. In the original analysis what I thought was and 18-year cycle was really 16. From the original analysis it looked like this. With reanalysis I got this. It shows an 18.6-year cycle but then look at what happened to the amplitude. The program allowed the 18.6-year cycle but knocked the hell out of the amplitude. I beg your forgiveness on the bad vision. I suffer from Kerataconis.